The Guysborough District Court House was constructed in 1842-43, the third such building to have been erected in the town. In 1973 it was replaced by facilities within the newly constructed Guysborough Municipal Building. For one hundred and thirty years this building served not only as a court house, but as a town hall, a forum for political debates and polling stations during elections, and even as an exhibition centre during agricultural fairs. While its architectural style is typical of early court houses (few of which remain in Nova Scotia today), the building has several unique features, including a projecting enclosed porch with a gable roof at the main entrance, and the attractive windows, arranged symmetrically around the building, with their tracery pattern culminating in an unusual pointed arch. The museum has various artifacts that have been donated or loaned by local residents. These artifacts give us a glimpse of the way that people used to live and also of the way they used to make their living. The museum has a lot of tools that give the person an idea of what was used in the agricultural and lumbering industries. There are also a number of fishing and marine displays because of Guysborough’s long marine history, as a sea port. The Old Court House with its exterior clad in naturally aged cedar shingles and its interior restored to its mid nineteenth century appearance when it was the most important secular building in the District of Guysborough. The museum has displays on the early Acadian settlement, a collection of local domestic tools and handcrafts, and a fascinating display of early photographs of Guysborough. Maps, local histories and genealogical records are available for research. 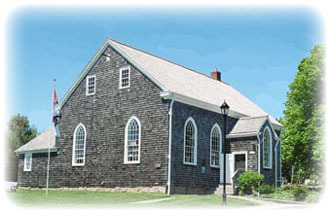 The Old Court House Museum is located in the heart of one of the most scenic areas in Nova Scotia, in the historic town of Guysborough at the head of beautiful Chedabucto Bay. The museum has been preserved and restored by the Guysborough Historical Society which, since 1976, has used the building to promote a better understanding of our cultural heritage and to serve as an information centre for visitors to Guysborough County.